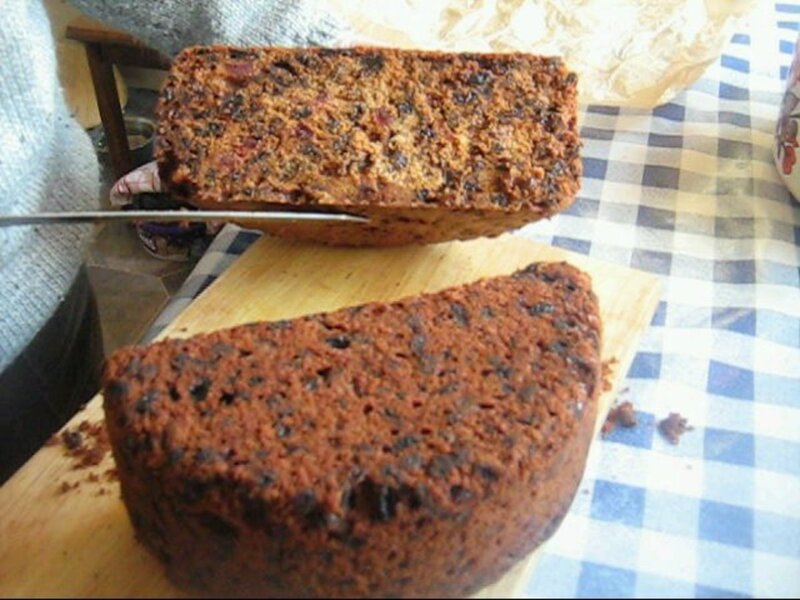 Here is a recipe for the traditional Christmas fruitcake. 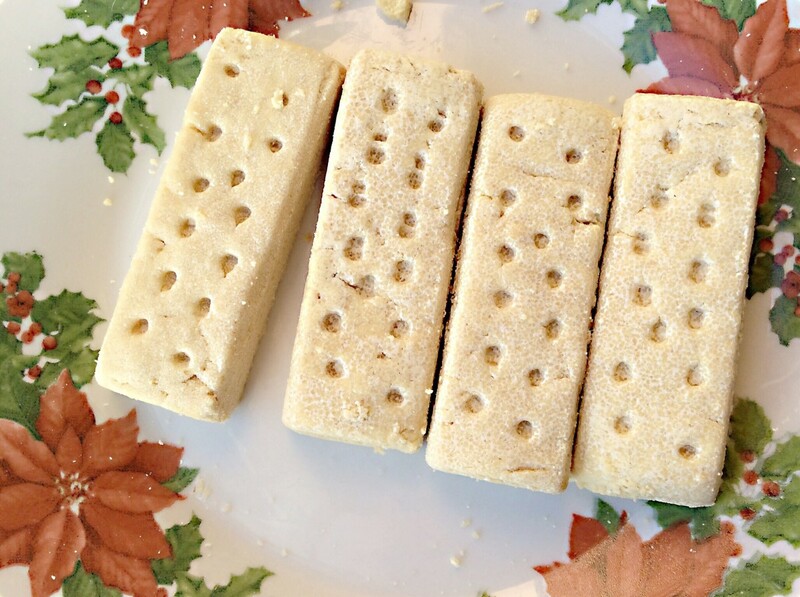 I have included step-by-step instructions with videos and pictures, which makes this recipe easy to follow. There is also a video of my 84-year-old mother making this cake. Christmas is a holiday that is associated with many traditions all over the world. Here in Europe, the food served for the Christmas dinner is usually turkey and ham with an array of vegetables. 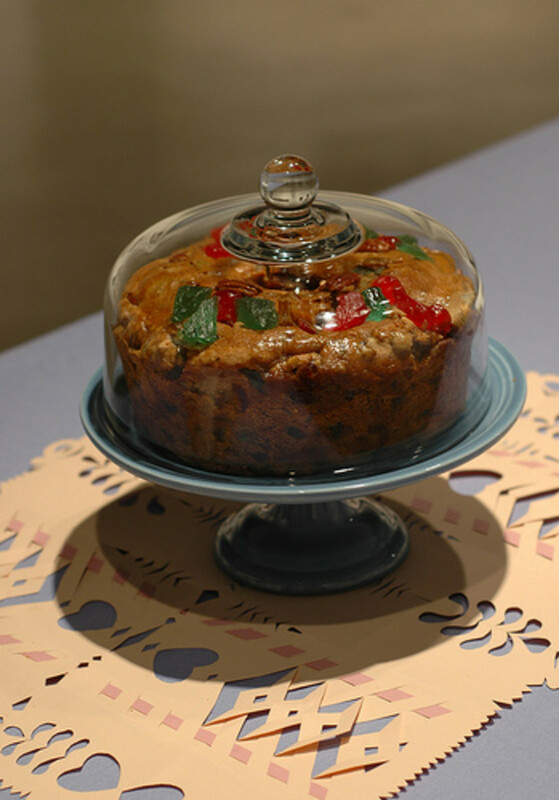 The Christmas cake and pudding are also part of the eating experience. Squeeze the juice from the lemon and orange and mix in to the fruit. Leave in the fridge to marinate for 24 hours. Now that you have waited 24 hours for the fruit to marinate you are ready to finish putting all the ingredients together to bake the cake. Before you begin mixing of the ingredients Pre heat the oven to 300 degrees F / 150 degrees C or Gas mark 2. Next take the flour and the eggs and mix into the bowl by using 2oz / 80g of flour to each egg. Add the flour first then an egg, mix well. Repeat the process until eggs and flour are used. If you are used to baking cakes then you can lightly whisk the eggs together and then add a small amount of eggs and flour together until it has been fully mixed in. You can use whatever size or shape of cake tin that suits your needs here.The tradition in our family has always been to have the smaller cake before Christmas in the guise of having to taste it before the big day lol. This year my mother added a third even smaller cake tin so she could bake a mini Christmas cake as a special thank you to my brother in law for his help during the year. He was delighted that the extra effort was made just for him. The amount of cake mixture you will have made with the above ingredients will fill a 10 inch / 25 mm deep sided cake tin, as well as a much smaller cake tin. Grease the tins and then add grease proof paper to the bottom and around the edges. The paper should come up above the tin by at least another 8 inches. This will prevent the edges from burning while the centre of the cake is cooking. Add the cake mix to each tin. Smooth out with a wooden spoon. 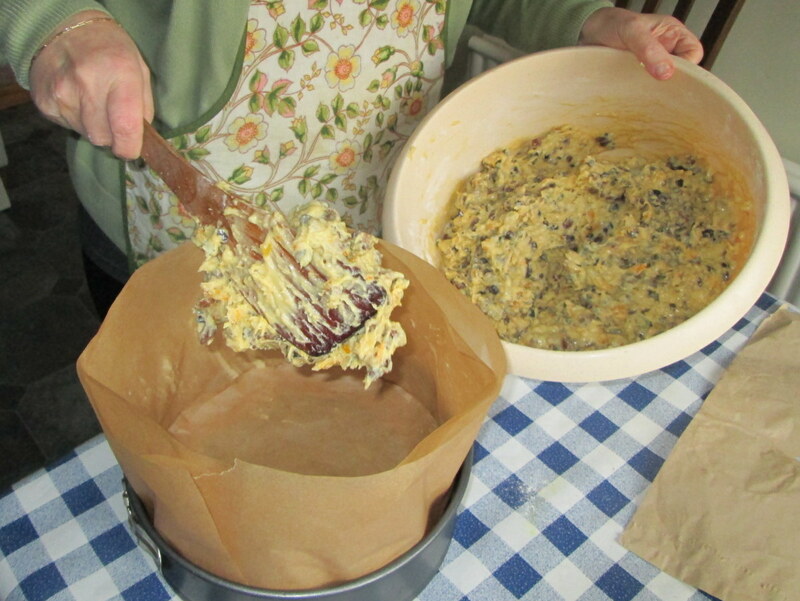 Below is a video of my 84-year-old mother making a fruitcake. 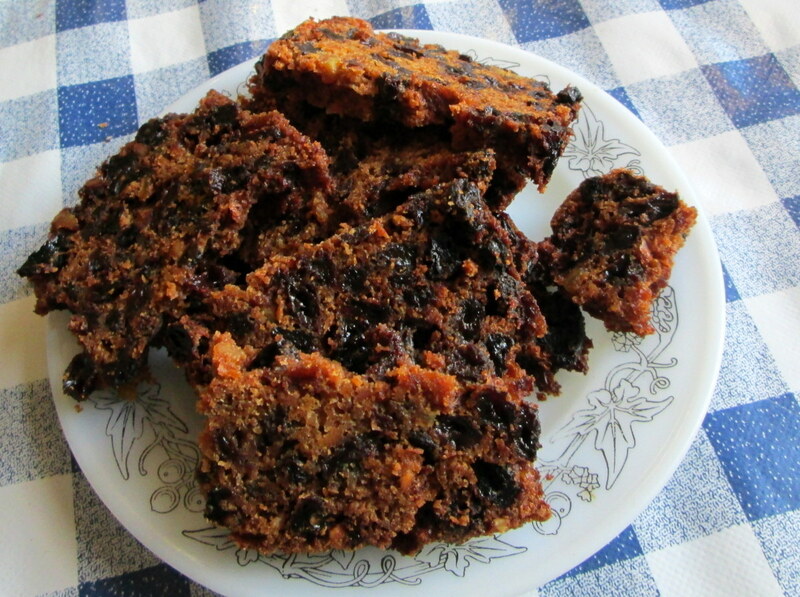 This recipe can be used to substitute for the ingredients above if you can not digest the extra spices that are included in the Christmas cake recipe. 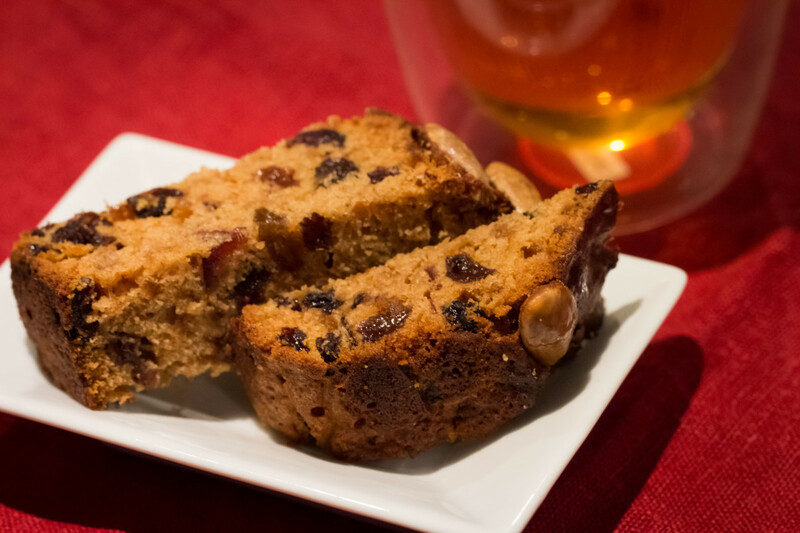 This video shows you how to make a basic fruitcake and includes all the methods in the recipe as explained above. 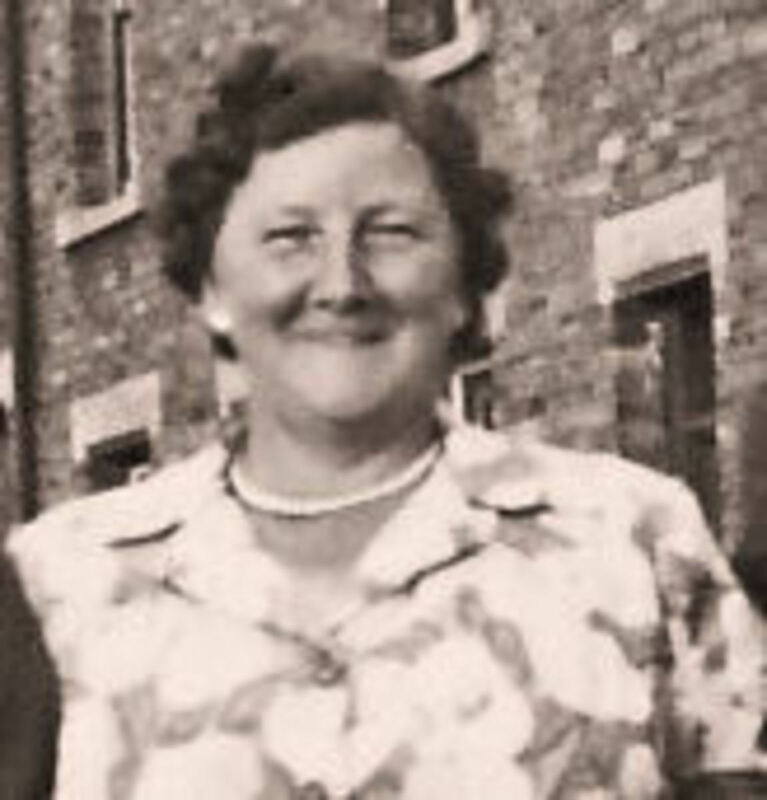 Place in the centre of the cooker. Bake for 4 to 5 hours depending on your own cooker. After 3 hours of baking add some more grease proof paper to the top of the cake mix, cutting a triangle hole in the centre. This will prevent the top of the cake from burning . Test the cake after four hours by opening the door and pulling out the tray. Then have a clean knife and pierce the centre of the cake. If it comes out clean and dry then the cake is cooked. If the knife is in any way wet then push the oven tray back in and cook for another 30 minutes. Repeat the testing process again. 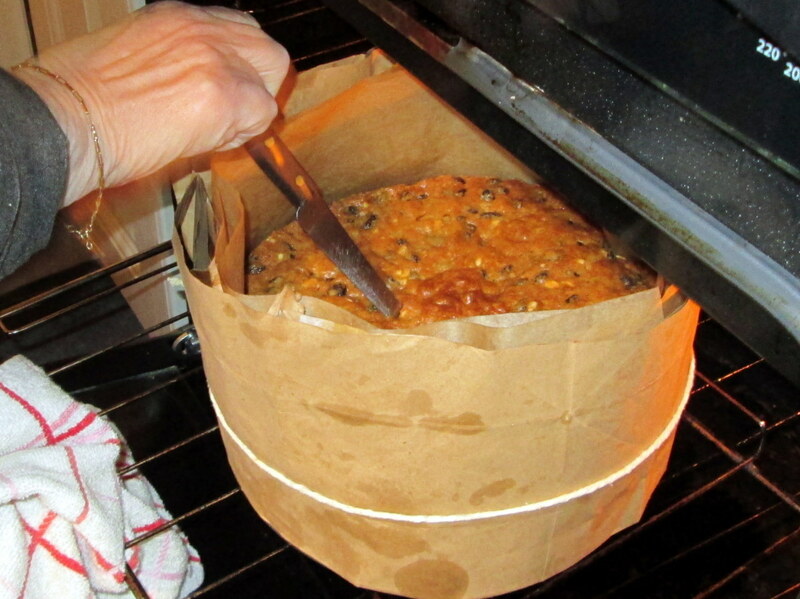 When the Christmas cake is cooked take it out of the oven but leave it in the tin until it has cooled down, this will enable you to remove it without any broken pieces. Once the cake is out of the tin leave it on a tray until it has completely gone cold. Make sure to have the cake already covered with the marzipan at least three weeks before you want to eat it. You will need to leave the icing for another two weeks for the best taste. The marzipan is already prepared so leave at room temperature a few hours before use. When you are preparing the cake for icing and decoration turn it upside down and use that end. This gives you an even surface to work on. Using a knife scoop out some marmalade or jelly and add to the cake. Spread it around the top and sides of the cake. If you put the knife in some hot water first then this helps to spread it evenly and quickly. Remove the packaging from the marzipan and then add a tiny bit of flour to the table and some on the marzipan. This will stop it sticking to the table and the rolling pin. Roll out to the required size and shape. The thickness should be about a quarter of an inch. 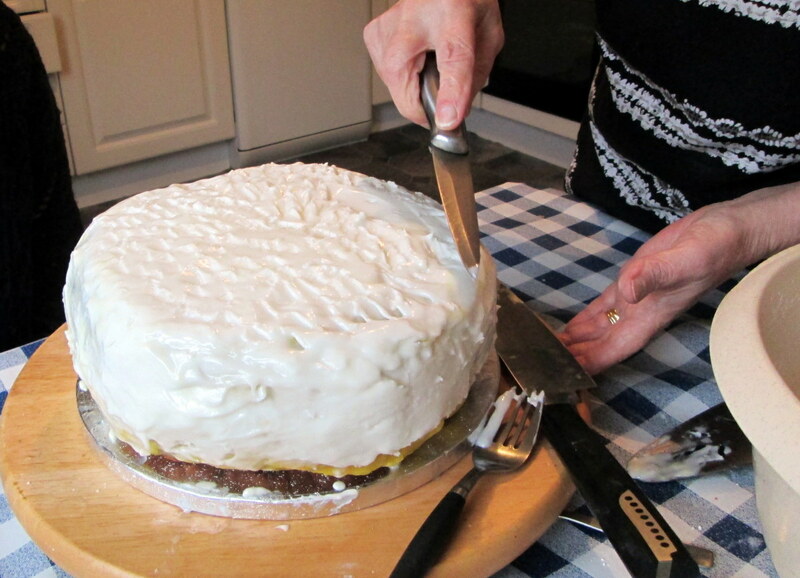 Place on the top of the cake and cut the edges with a sharp knife. Roll out more marzipan in thinner strips for the sides. 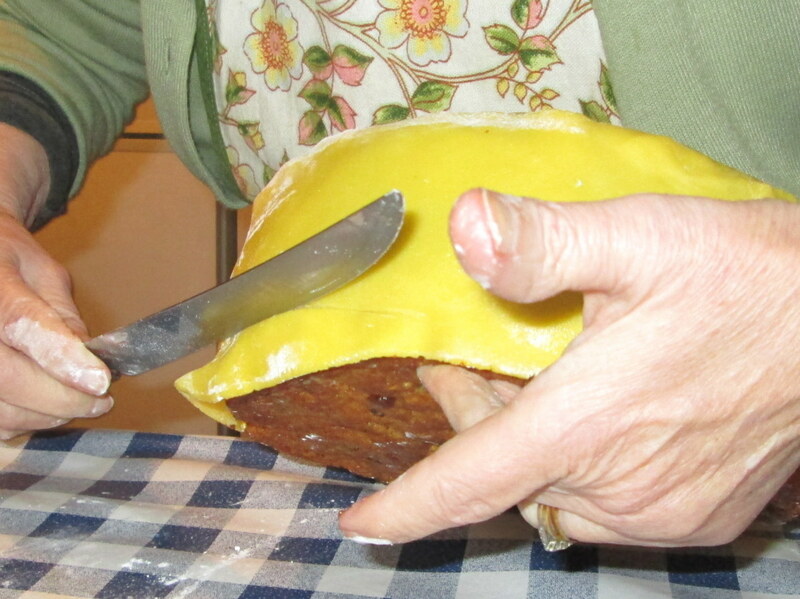 Place the strips around the cake and push together so that all the marzipan is firmly and evenly placed on the cake. It is also best for the flavour of the Christmas cake to leave in a cake tin or other container for at least a week before you add the icing and the decorations. Wrap the cake in clean grease proof paper and then wrap again with tin foil. Place in a container and store in a cool place. If you attempt to add the icing too soon the oil from the marzipan with seep through the icing and create a messy looking finish. 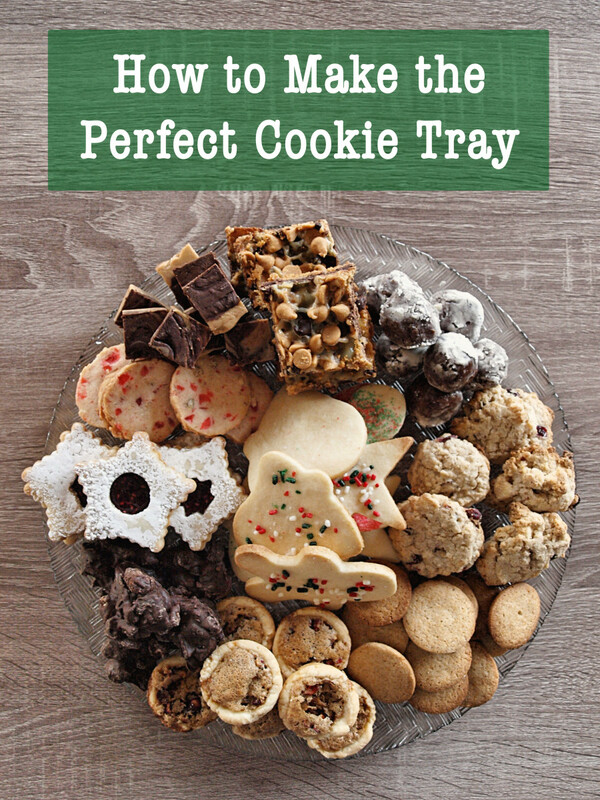 Remove from the packet and place on the table with a tiny bit of flour underneath. Roll out to the required size and place on to the cake. Cut off the edges with a sharp knife. Do the same for the sides. 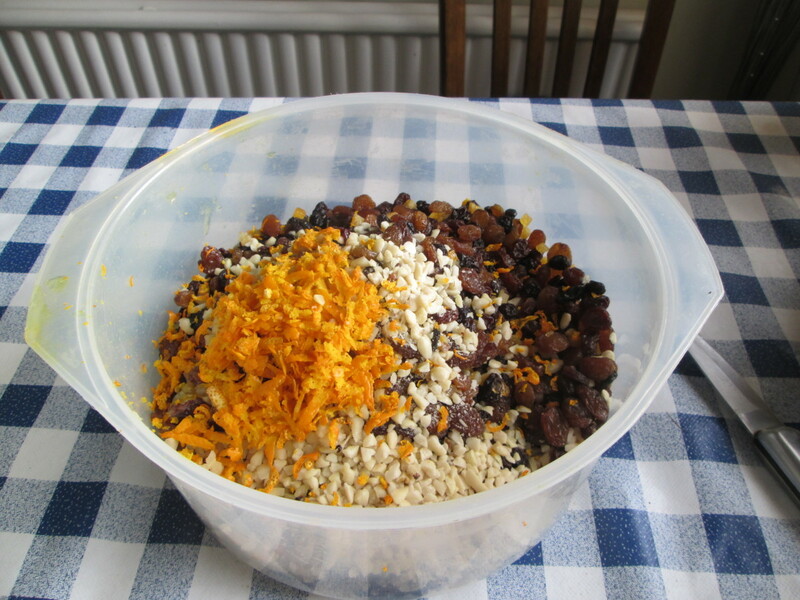 Pour the mixture into a bowl and add some water. Mix with a wooden spoon making sure to get out all the lumps. If it is too thick to spread then add more water and continue to mix. Once it is the required constituency you can put a large amount onto the top of the cake. Then boil some water and add to a cup. Place the knife into the hot water as you spread the icing over the cake. 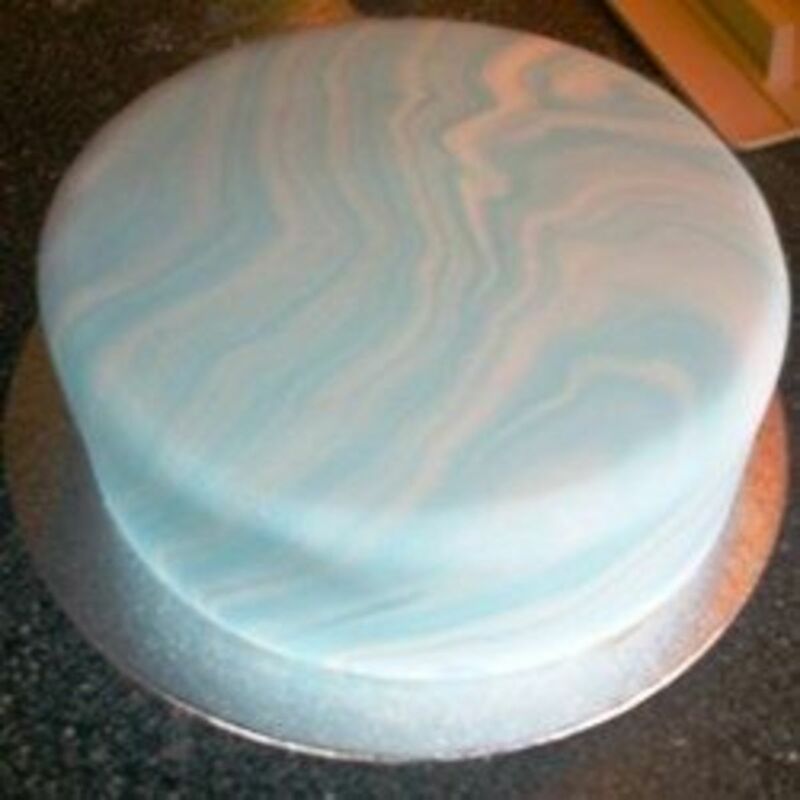 You can spread the icing evenly or in raised waves like I have done for this cake. 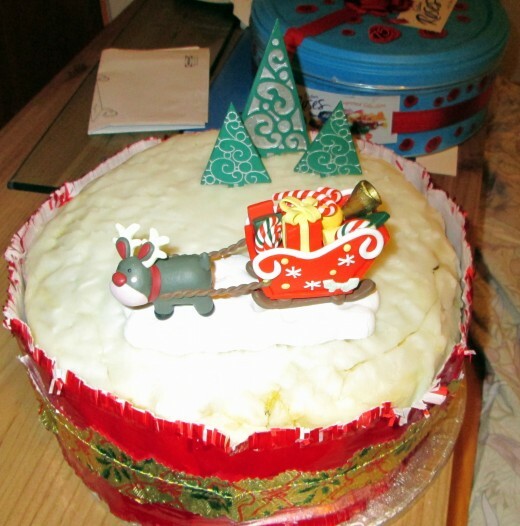 The icing does not take too long to dry and become hard so it is best to arrange your Christmas decorations on the top of the cake as soon as possible. I always find the cake looks a lot better if a ribbon has been placed around the sides of the cake. These can be bought especially for this purpose. You can then finish off decorating the Christmas cake by adding either a Christmas tree, sleigh, Father Christmas, Santa or reindeer etc . Place back in the cake tin ready and leave for at least two weeks. 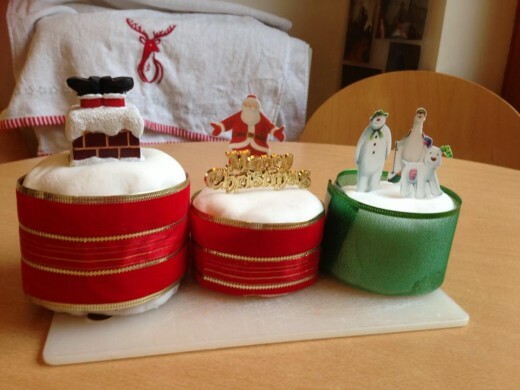 You now have your own home made Christmas cake baked and decorated ready to be presented and eaten on Christmas Day. Never had Rum in a Christmas Cake but it does sound tasty. I am glad to have inspired you to make one for this Christmas Creativelycc. Thank you so much for this wonderful hub. 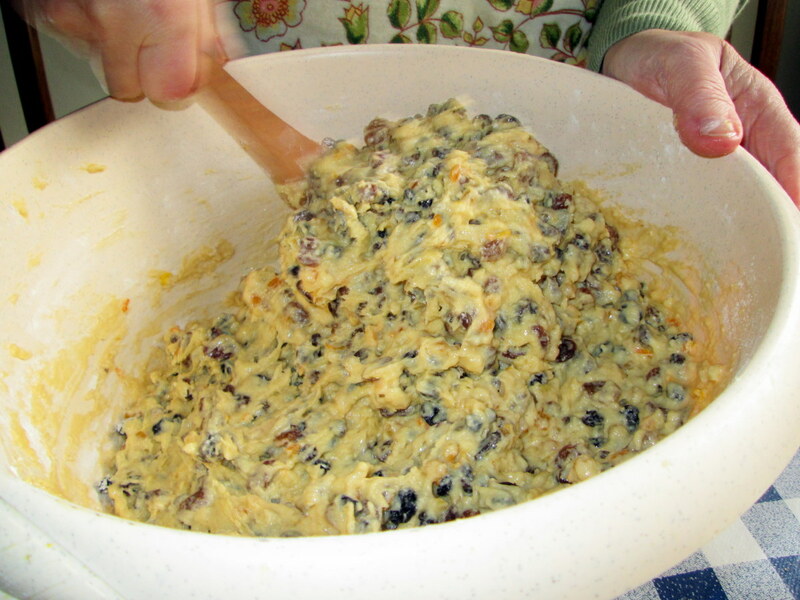 I am definitely going to make a Christmas fruitcake for Christmas this year. My mother used to make it every year. I'm going to use rum in my cake. Excellent and refreshing hub!!! Yes Christmas is fast approaching again Manasi4. your name is similar to someone on bubblews. are you there?